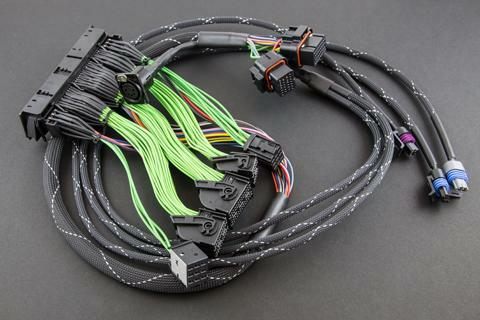 Boomslang Plug n Play Harness - MoTeC M Series MAZDA - MiataRoadster - Stay tuned with MiataRoadster! These harnesses are for the use of MoTeC’s M400, M600, M800 and M84 units. The MoTeC M Series has full control of fuel and ignition timing. Choose your specific vehicle in the dropdown menu and then select the MoTeC M Series unit you wish to use. Eight cylinder engines are generally best suited to the M84 or M800 unit to retain sequential injection. The M400 and M600 are suitable if batch injection is acceptable. Direct fire eight cylinder engines will be converted to wasted spark in the Boomslang harness. Six cylinder engines are generally best suited to the M84, M600 or M800 unit to retain sequential injection. The M400 is suitable if batch injection and wasted spark ignition is acceptable. Four cylinder engines can be operated with any of the available M Series units and still retain sequential injection and direct fire ignition. The factory check engine light is controlled by the MoTeC if possible, unless otherwise requested.